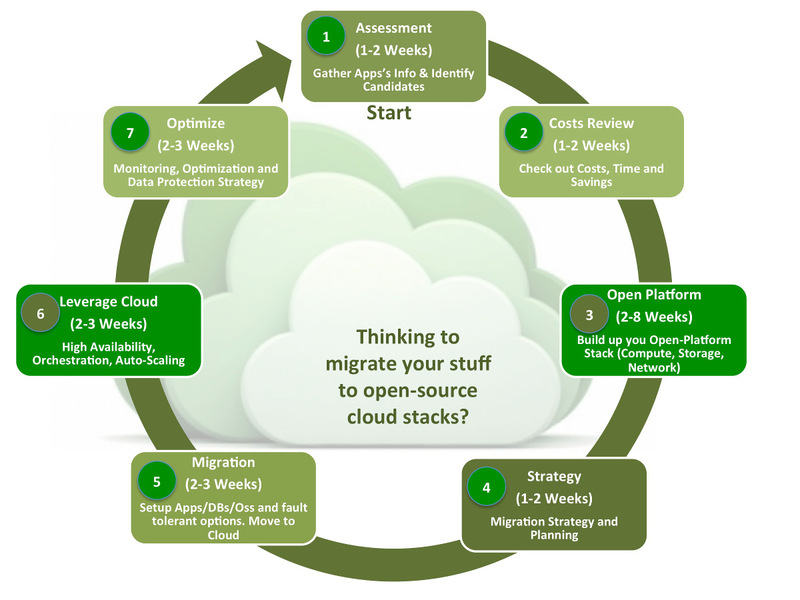 Thinking to migrate your stuff to open-source cloud stacks? No doubts that OpenStack is the preferred orchestration platform among super cloud’s users. If you are figuring out how to lower IT operation costs, this post could help you out to understand its complexity and benefits. Before implement any open platform stack, check out what Apps are candidates to move out into it. There isn’t such thing as a perfect recipe to identify candidates. You could try to identify Apps prone to run on an open solution like KVM. Despite the App would run properly without issues, App’s vendors could make you change your mind on your try. Most of the vendors wouldn’t give you any support or would make your licence costs increase shamelessly, if you don’t use their property stack as the underlay infrastructure. A tech-junkie like me, loves to put to work techs like these, just to see how what happens. Nevertheless, the change is good only if you get savings. After you identify the candidates, you would run maths to check out if you will effectively get a reduction in your operation costs. Despite OpenSource is for general usage at no cost, you will need a talented tech team to maintain it. Talent is not cheap (I am not talking about just the salary). What Applications, versions and type of licenses do you have in your Company? What Databases, versions and type of licenses have every application that you’ve just named? What Operating Systems, versions and type of licenses do you have in each server instance belong to your application? How much memory and disk do you have at every server regarding to every application? As we can see, three of these apps are candidates to migrate to an open platform: the blue filled rows. The red filled ones don’t need a further explanation: take apps to a web delivery subscription model is the best option to any business by far, unless industry regulations don’t let you use a public service that shares resources between customers. The green filled row form the previous table is a case worth to check. Some vendor’s apps can not entirely works on an open platform stack. Even they can run without technical issues on KVM, some vendors ask to use their own hyper-visor tech or an enterprise-licensed like ESX. If you don’t meet this requirements, they won’t bring you the technical support that you need. SAP obligates you to work with ESX and other tech conditions. SAP is know for this inflexibility, and besides this could be a important factor to guarantee the success of any of their implementations, it’s also the main reason that customers are trying to scape out of it and moving out to a web app delivery subscription model (SaaS). Similar cases are find with vendors like Oracle. Oracle databases can not run on KVM, or you will be charge for the entire number of physical CPU cores. The best way to avoid this obscene cost, is using OVM (Oracle Virtual Machine), a modified Xen open-source project. This makes you to buy Oracle Linux, the only distribution that come with OVM. But Oracle Linux is cheaper if you buy Oracle hardware to run it on, and so on. It’s a trap that starts up from the Hyper-Visor. Either SQL server, and its enterprise license, requires Hyper-V to avoid prohibited costs. Other cases are specific to linux’s distributions. RedHat could work perfectly into KVM, but you have to use their KVM distribution to be allowed to get their updates as part of the maintenance subscription. Finally, an important number of app’s vendors force you to stay on their preferred compute virtualization tech. The type of hyper-visor depends on the type of application, database and operating system running on the instances. Choosing the Hyper-Visor based on performance metric is not the correct way anymore. Hyper-Visor is commodity stuff and Orchestration systems are also doing their job to keep them out of sight. Nevertheless, Apps and DBs license costs are the most important factor to evaluate candidates to migrate to open platforms. As soon as you’ve defined what hyper-visor, then you would know how many OpenSource projects you will be using in your stack. If you’ve defined to use KVM (i.e. using the Canonical’s distribution), then you can use the Ceph project as the storage tech component in the stack. Ceph project also works with OpenStack Cinder. Ceph project could be used under the GPL, even if the KVM is not under the same license model. Ceph is one of the most used Storage project among OpenStack users. Back to our green-filled row. If you need to work with comercial Hyper-Visors like KVM or Hyper-V, your options to use Open Source will be limited. Ceph is not an Storage tech option with any of them. You can use traditional arrays connected through tradional protocols like iSCSI or NFS. A good option to keep the modular concept of white boxes could be EMC ScaleIO or VMWare VSAN. Both techs could be a perfect match with ESX. The same situation happens with ESX’s Network Virtualization. VMWare NSX should be the preferred network component for ESX. The type of Hyper-Visor that you finally choose will define the rest of the tech components in the stack. Depending on that you would go into pure or partially open source platform. Next picture shows the migration steps from the identification of the candidates to the optimization of the resources. Timing is estimated. The required timeframe to build up your open platform depends on the availability of the hardware, network connections, datacenter conditions and the experience of the technical team. Later on, there are important tasks like to the leverage cloud: get advantage of the cloud’s orchestration and automation resources; and the optimization of the resources through monitoring and ensuring a appropriate data protection estrategy. The last standing resource will be a migration at functional level. Timing depends on the functional complexity of every application. Migrate from an comercial App/DB/OS to a GPL’s one: Migrate from a RedHat Enterprise Linux distro to an Canonical’s one to avoid get trapped into a maintenance subscription. Or migrate from a SAP CRM to Sugar CRM to avoid enterprise license renewal costs. Migrate between different linux distro is not so risky. Almost any open-source app or database project that works into a comercial linux distro works into a GPL’s one. If you migrate a WebApp based on Tomcat/MySQL from RHEL to Ubuntu’s OS, then you will save important bucks regarding to ReHat maintenance subscriptions to Guests/Hosts OSs. This kind of change is fast and with guarantee of success if you have a talented team to support it. However, if there’s some vendor’s software to move between OSs, you need to check very carefully technical and license liabilities before anything. Migrate data and processes at App level is struggling, expensive and risky. Review it very well before to go in. This option requires a functional team that understand your business processes. A valid option is start over into a new App and leave the old one just as reference. The drawback is you will have to keep the double management for years. This option will require an exhaustive review. First Steps to Creating a Cloud Computing Strategy for 2013 at Forbes: A bit old and it’s still the reality for many companies on their need to evaluate their Cloud strategy into their IT budget. I like the “Cloud decision framework”. It’s a good starting point. Virtualization and Cloud Migration: This the description of the MIgration services of a IT Professional Services Company. However, I like they way they describe them, the requirements, the challenge, and the planing that they sum into the picture that I’ve just stolen for this post.